What Else Can I Expect From an Online Master's in Math Education Program? Earning an online master's degree in math education can make graduates more competitive in the job market than those holding only a general bachelor's in teaching. Math teachers at all levels of education are usually in high demand, and as a result, they often receive higher salaries and land jobs more easily than other teachers. As schools throughout the country emphasize the importance of STEM fields -- Science, Technology, Engineering, and Math -- the demand for highly-qualified math teachers continues to grow. Additionally, a master's in math education allows graduates to teach at many community and junior colleges, where salaries are higher than those at the K-12 level. According to the Bureau of Labor Statistics (BLS), the annual median salary for postsecondary mathematical science teachers reaches $70,910. Graduates of the best online master's in math education programs benefit from more opportunities in their career and increased earning potential. Furthermore, these programs provide learners with a thorough understanding of contemporary mathematics theory and highly effective teaching skills. Math teachers already enjoy a wide open job market, and teachers with a master's degree earn higher salaries. Most programs also lead to teacher licensure, which institutions require for teaching at the secondary level. To find the right online program, you should decide which factors matter most to you. Consider variables such as program cost, length, instructors, the type of courses and specializations available, accreditation status, and whether an institution offers student teaching opportunities. CAN I WORK WHILE I COMPLETE MY ONLINE MASTER'S IN MATH EDUCATION? One of the benefits of getting your master's degree in math education online lies in the fact that you can work while you attend school. Online classes provide students the flexibility to complete coursework when and where most convenient, as long as they meet deadlines. Of course, you must balance your work commitments to ensure that you can still complete school assignments. WHAT ARE THE ADVANTAGES TO EARNING MY MATH EDUCATION DEGREE ONLINE? Learners enjoy several advantages to earning their math education degree online. First, by studying through the internet, you can attend your preferred school, even if it resides far away from home. You also enjoy the flexibility of completing coursework when convenient for you instead of attending class at assigned times. Finally, online programs often prove more affordable than completing your degree at a brick-and-mortar school. The University of Washington (UW) was founded in 1861 by northwestern pioneers in downtown Seattle. Today, UW is a public research university that provides bachelor's, master's, and doctoral degrees to over 45,000 learners across 140 departments. Among these programs is UW's online master of science in applied mathematics, which attracts degree-seekers interested in a rigorous yet flexible education option. This 36-credit program takes 1-3 years and includes training in numerical analysis and scientific computing, climate modeling and mathematical finance, and nonlinear wave structures. All course content is offered completely online in a cohort-based learning format that allows learners to strike a balance between collaboration and flexibility. Working professionals can enroll part time while full-time learners can carry more credits. Degree-seekers interested in applying must hold a relevant bachelor's degree from an accredited institution with a minimum 3.0 cumulative GPA. UW uses a simplified transfer policy that allows learners to apply outside credits toward their master of science in math education online degree. UW is regionally accredited by the Northwest Commission on Colleges and Universities. Western Governors University (WGU) is a nonprofit, online-based institution established by a group of 19 U.S. governors in 1997. Based in Salt Lake City, Utah, with eight affiliate campuses across the country, WGU provides distance programs for 50 degrees across four different colleges, including a special master of arts in teaching mathematics education (secondary). WGU is an attractive option for students with a non-teaching bachelor's degree who are interested in pursuing a master's in math education online. WGU's master's in math education online includes 22 courses and takes 1-3 years. The program delivers all course content completely online at a customizable pace, so learners can balance their education with their careers and other pre-existing commitments. Key subject areas include mathematics education pedagogy, classroom management, statistics and probability, mathematics history and technology, foundational perspectives of education, and principles of adolescent development. Learners interested in applying need a relevant bachelor's degree from an accredited institution and must submit official academic transcripts. Applicants seeking teacher licensure must also undergo a criminal background check, demonstrate student teaching experience, and pass a state-specific skills exam. WGU is regionally accredited by the Northwest Commission on Colleges and Universities, and its online master's in math education has programmatic accreditation from the Council for the Accreditation of Educator Preparation. Initially founded in 1846 with campuses in Buffalo and nearby Amherst, New York, the University at Buffalo (UB) serves over 30,000 learners across 13 colleges each year. Located minutes from Niagara Falls, UB is the largest public research university in New York, granting nearly 400 undergraduate and graduate degrees, including a master of education in mathematics education. This 33-credit program, attainable in 2-3 full-time semesters, is one of the most affordable online master's in math education options. In this program, learners examine a variety of topics related to professional licensure and certification, including problem solving in mathematics, the history of mathematics, assessment of math performance and understanding, and elementary math instruction. Eligible degree-seekers need an undergraduate degree in mathematics or at least 30 hours of academic credit in the field. Applicants must also submit recent GRE or MAT scores and two letters of recommendation. Once enrolled, learners can choose to study completely online or through a hybrid format. The University at Buffalo has been regionally accredited by the Middle States Commission on Higher Education since 1921. UB's math education master's has programmatic accreditation from the Teacher Education Accreditation Council. Chartered as a land grant university under the expansive Morrill Act in 1869, the University of Nebraska - Lincoln (UNL) is the oldest public research university in the Cornhusker State, providing academic instruction to nearly 50,000 learners in 275 programs. Among those programs, UNL offers a master of arts in teaching in mathematics for online degree-seekers. This flexible program requires 36 credits and offers a variety of specializations. Most degree-seekers complete the program in 2-3 years, and graduates are qualified to take teaching licensure exams. Program topics include math as a second language, inquiry into teaching and learning, instructional technology in mathematics, and functions, algebra, and geometry. Interested degree-seekers must submit relevant academic transcripts, three reference letters, and a resume. They must also provide a brief statement of purpose indicating why UNL is as a good fit for their long-term career goals. UNL boasts regional accreditation from the Higher Learning Commission and programmatic accreditation in math education from the Council for the Accreditation of Educator Preparation. East Carolina University (ECU), a public research institution located in Greenville, North Carolina, is the fourth largest university in the Tar Heel State. Initially founded in 1907 as a teacher training school, ECU confers more than 175 degrees and is home to nearly 30,000 learners each year. Among their graduate and professional programs is their master of arts in mathematics education. Designed with busy professionals in mind, this master's in math education online consists of 36 credits. Part-time students typically graduate in two years. The program provides concentration options for elementary, middle school, and high school instruction. Topics covered include research in mathematics education, mathematical modeling, and mathematics assessment for the classroom teacher. Learners interested in applying to ECU's master's degree in math education online need an accredited undergraduate degree in mathematics or a related field and must provide recent GRE, MAT, or GMAT scores. ECU is regionally accredited by the Southern Association of Colleges and Schools. Located in sunny Fort Lauderdale, Florida, Nova Southeastern University (NSU) boasts 150 programs of study, including a master of science in mathematics education that prepares learners for middle, secondary, and postsecondary teaching careers. Chartered in 1964 with an inaugural class of only 17 students, NSU now serves over 20,000 degree-seekers each year. NSU's master's in math education online is a 36-credit program that most students finish in two years. Courses cover foundational topics like history, current trends, and technology in math education, problem-solving strategies, algebra and geometry, and educational research. This program delivers all content digitally, allowing learners to tailor course schedules to their individual circumstances. Interested degree-seekers must hold a relevant bachelor's degree from a regionally accredited institution with a minimum 2.5 cumulative GPA. Once admitted, students must maintain a minimum 3.0 GPA and complete all degree requirements, including a capstone professional experience. NSU and its master's in math education online hold regional and programmatic accreditation from the Southern Association of Colleges and Schools and the National Council for Accreditation of Teacher Education. Established in downtown Philadelphia in 1851 by Jesuit leaders, Saint Joseph's University (SJU) offers over 100 graduate and undergraduate programs. This private, Roman Catholic university provides academic programming in a variety of disciplines, including a master of science in secondary mathematics education. This 30-credit hybrid program offers both online and on-campus instruction methods, including capstone options for students interested in earning professional certification. Degree-seekers enrolled in the program explore an array of pertinent topics including the history of mathematics, mathematical problem solving, reading and research in math education, and secondary math curriculum. Graduates usually finish in two years and go on to certification exams and careers in secondary math instruction. Learners interested in this online master of science in math education must hold a bachelor's degree in a STEM subject from a regionally accredited institution. They must meet course prerequisites in calculus and submit a resume, brief statement of purpose, and two letters of recommendation. SJU maintains regional accreditation with the Middle States Commission on Higher Education. Founded in 1927 as a junior college, the University of Houston (UH) is now a public, state research university — the fourth largest in Texas. UH offers nearly 300 degrees through its 14 academic colleges, including a master of education in mathematics education. This 36-credit degree is an affordable yet rigorous program that prepares learners to teach mathematics at elementary, middle, high school, and collegiate levels. Through flexible online instruction, degree-seekers study theories of curriculum development and implementation, learning and assessment objectives, and overall equity in mathematics education. Candidates for this master's in math education online must have a bachelor's degree in a relevant field and recent GRE scores. For the duration of the program, degree-seekers must maintain a minimum 3.0 GPA. UH is regionally accredited by the Southern Association of Colleges and Schools, and its math education degree is programmatically accredited by the Council for the Accreditation of Educator Preparation. Drexel University is a private research institution located in Philadelphia's University City neighborhood. Since 1891, Drexel has provided high-level education in the practical arts and sciences, now offering 150 different degrees and programs, including a master of science in mathematics learning and teaching. This 46-credit master's boasts a flexible delivery format designed for working professionals. Coursework is organized around four, 10-week quarters, allowing learners to take more courses in less time. Topics include subject-specific foundations and emerging technologies in education. Learners study mathematical thinking models, problem-solving strategies, and multimedia instructional design solutions. Degree-seekers interested in applying to Drexel's program must have a relevant undergraduate degree with a 3.0 minimum cumulative GPA, including in math prerequisites. Applicants also need current teacher licensure at the middle or high school levels, at least two letters of recommendation, a current resume, and a brief personal statement. Drexel maintains regional accreditation from the Middle States Commission on Higher Education. Iowa State University (ISU) is the largest public research university in the Hawkeye State. Founded in 1858, ISU supports nearly 35,000 students each year, including online and distance learners. ISU's master of school mathematics online degree promotes educational excellence by training secondary mathematics teachers. The 32-credit hybrid program delivers course content through a combination of online platforms and two-way video. Most degree-seekers complete the program in 1-3 years, covering topics like discrete mathematics and applications, algorithmic analysis and computer implementation, statistical methods, and intermediate geometry. Additionally, the creative capstone course requires students to research an advanced topic in mathematics education. Eligible candidates need an accredited bachelor's degree in a related field, a current teacher certification, and at least two years of work experience. ISU offers a simplified admissions process, requiring only a statement of purpose, a current resume, and letters of recommendation. ISU carries regional accreditation from the Higher Learning Commission. Founded in 1787, the University of Pittsburgh (Pitt) is a public research institution located in the Oakland neighborhood of Pittsburgh. Pitt is home to nearly 20 undergraduate colleges and graduate schools, offering courses across a variety of disciplines including a master of education in mathematics education. This 36-credit online master's in math education offers high-level, focused instruction in educational psychology, proportional reasoning, math problem solving, social and cultural perspectives on education, and field-specific research methods. Classes are offered fully online, making the course flexible enough to complete with a full-time job. Applicants need a relevant bachelor's degree with a minimum 3.0 GPA. They must submit official transcripts, reference letters, and a written statement of career goals. Pitt maintains regional accreditation from the Middle States Commission on Higher Education. A public research university located in Fairfax, Virginia, George Mason University (Mason) offers undergraduate, graduate, doctoral, and law degrees. Initially founded in 1949 as a branch of the University of Virginia, Mason has been an independent institution since 1972. Mason's master of education in educational leadership with a K-8 mathematics specialist leader concentration ranks among the best math education online master's programs for its unique emphasis on leadership development in K-8 math instruction. The program consists of 30 credits and most students finish in three years. Tailored specifically for working professionals, this hybrid program uses a combination of synchronous and asynchronous online courses and evening classes. Topics covered include mathematics learning and assessment, curriculum development, mathematics leadership development, probability and statistics, and algebra functions. Graduates are prepared to take K-8 specialist certification tests. Admissions requirements include a relevant bachelor's degree from an accredited institution, three years of full-time teaching experience, three letters of recommendation, and a brief goals statement. Eligible candidates go through an additional interview process. Mason holds regional accreditation from the Southern Association of Colleges and Schools. Founded in 1908 in the Shenandoah Valley of Virginia, JMU still occupies its original scenic campus location in Harrisonburg. The university enrolls more than 22,000 students and offers over 130 undergraduate and graduate programs, including 10 fully online degrees. U.S. News & World Report ranks JMU as the second-most innovative regional university in the nation, and the second-best public university in the South. The master's in math education online at JMU encompasses 34 credits in a combination of educational development and math requirements. Course topics explore the history of mathematics, modern algebra and geometry, and probability and statistics. The M.Ed. in mathematics suits aspiring and practicing high school math teachers, preparing graduates to teach high-level subjects, including advanced placement courses. JMU's math education online master's program curriculum follows recommendations by the Conference Board of the Mathematical Sciences. Applicants must hold a bachelor's degree from a regionally accredited institution and complete at least 18 credits in math prerequisites, including linear algebra and multivariable calculus sequences. Students may apply to begin the program in the fall, spring, or summer term. Students complete courses on the Canvas platform in both synchronous and asynchronous formats. JMU offers new students an online readiness assessment before enrolling them in distance programs and provides full support resources for enrolled students, including tutoring, counseling, career services, and tech support. Beginning in the mid-1800s in Cedar Falls, UNI saw previous incarnations as an orphanage and a teachers' training school. Today, it enrolls nearly 12,000 students and offers more than 90 major areas of study across four academic schools. The university ranks among the best regional colleges in the Midwest according to U.S. News & World Report. UNI's online MA in mathematics features an emphasis in secondary teaching. The non-thesis master's in math education online encompasses 33 hours in required, research, and elective courses, culminating in a research paper requirement. Core topics explore differential geometry, mathematical analysis, and advanced algebra. Students may choose from electives in topology, theory of numbers, and statistical quality assurance methods. The program provides secondary math teachers with an advanced understanding of mathematical concepts to further their teaching practices. Students enrolled in UNI's online master's program complete coursework as part of a cohort group. While fall and spring coursework occurs online, summer courses require students to attend two weeks of in-person instruction at the Cedar Falls campus. Applicants must hold teaching licensure and demonstrate teaching experience to qualify for admission. UNI does not require GRE scores for admission consideration. Students pay a set, per-credit tuition rate for graduate coursework, regardless of the student's state of residence. Distance learners may start the program as new cohorts form during the fall, spring, and summer semesters. Students complete courses online through the Blackboard learning management system, with support resources including tech support, tutoring, test proctoring, and summer workshops. Established in 1877 by the Society of the Jesuits, UDM represents the largest and most comprehensive Catholic university in the state of Michigan. The school serves more than 5,000 students at its campuses in northwest and downtown Detroit, and online. Students can choose from more than 100 degrees and programs across seven academic schools. UDM recently ranked among U.S. News & World Report's best schools in the Midwest for the 18th consecutive year. 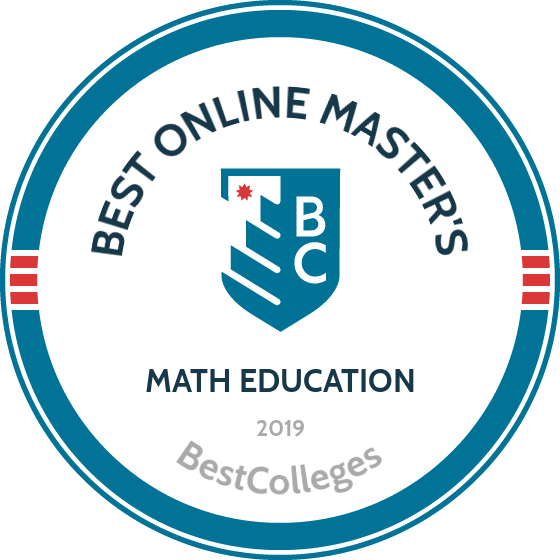 The master's in math education online aims to enhance teaching skills for current middle and high school math instructors. The curriculum emphasizes instructional technology and contemporary teaching methods. UDM's MA in math education requires courses in education, mathematical content, and mathematics education, culminating in a capstone experience. Students can choose to complete a thesis or a teaching portfolio and research project to fulfill the capstone requirement. Applicants must hold a bachelor's degree, demonstrating a mastery of college mathematics including calculus and a minimum 3.0 GPA to qualify for admission into the MA program. Candidates must also hold a teaching license or be in the process of obtaining licensure. Students who do not meet all admission requirements may earn provisional acceptance into UDM, provided they can satisfy all prerequisites before enrolling in graduate study. UDM students complete courses online through the Knowledge learning management system. All distance learners pay the same per-credit tuition rate, regardless of their state of residence. Students can access online learning support, including career assistance, virtual tutoring options, library databases, and tech support through the student portal. One of 64 schools operating in the State University of New York (SUNY) system, the College at Brockport offers hundreds of online programs through its open courseware portal. SUNY students may choose to complete programs through one of 47 campus locations in New York or online, including coursework available through SUNY+, which offers an additional suite of support and services for online learners. The master of education degree online at Brockport features a concentration in adolescence mathematics. The 30-credit program suits teachers who instruct grades 7-12, and who hold licensure or are in the process of earning an initial-level teaching license in New York. Students may choose to complete all coursework online or through a blended format. Brockport's master of science in education in adolescence mathematics prepares graduates for professional-level licensure in math education in middle- and high-school settings. Applicants may transfer up to 12 credits toward prerequisite requirements for the master of science in math education online, provided they earned at least a B grade in each course. Upon enrollment at Brockport, all students receive a personal concierge, who acts as a one-stop service provider for all academic and administrative needs. Though not expressly required, students may seek out supplemental work experience through internships and practicums while completing course requirements online. Students complete courses asynchronously through Blackboard. Brockport offers a variety of resources for online learning support, including financial aid advisers, technical support, and free online demos of Blackboard courses for prospective learners. Brockport offers variable per-credit tuition rates, based on enrollment and residency status. Serving more than 58,000 students in North Texas and around the world, UTA occupies a main campus in Arlington and a comprehensive online division. The university offers more than 180 bachelor's, master's, and doctoral degrees across 10 academic schools, including intensive online education programs accredited by the National Council for Accreditation of Teacher Education. The master's degree in math education online at UTA includes a focus on curriculum and instruction (C&I). The 30-credit M.Ed. in mathematics C&I combines prerequisites and major coursework requirements and does not require a thesis. Courses explore advanced teaching models for diverse learners, problem-solving, and effective teaching and learning for modern students. Learners must complete a two-part capstone in understanding, designing, and implementing classroom research. The M.Ed. in C&I serves practicing K-12 math teachers, and does not lead to initial teaching licensure in Texas. Students may complete the accelerated program in as few as 18 months online. All online programs at UTA keep class sizes small to ensure students receive individualized attention from instructors in the virtual classroom. UTA charges a set tuition rate for online master's-level study for all students, regardless of their state of residence. Students complete courses through Blackboard. UTA accepts applications on a rolling basis, and the program offers multiple start dates throughout the year. Distance learners can access support services, such as online advising, a writing lab, and comprehensive virtual library databases. UTA also operates a tech help desk, offering assistance by phone, email, and a ticketing system. Located on 780 acres in Muncie, Indiana, Ball State emphasizes immersive learning and practical research across its diverse academic programs. The university currently serves a student population of more than 22,500, offering 190 majors across seven schools and colleges. Graduates of Ball State boast a 93% career placement rate. Ball State offers two master's in math education online degrees through its Department of Mathematical Sciences. The MA in mathematics education with a concentration in secondary teaching suits K-12 educators with active licensure in their state of practice. This 30- to 32-credit program emphasizes content knowledge for teaching mathematics, and pedagogical knowledge and research regarding secondary school students. Students may also pursue an online MA in postsecondary foundational mathematics, ideal for aspiring community college math instructors. Students enrolled in the online MA in mathematics education (K-12) may complete the program in two to three years, while full-time learners in the accelerated MA in postsecondary foundational mathematics may complete the degree in 18 months. Applicants must hold a bachelor's degree from a regionally accredited institution with a minimum GPA of 2.75 or a cumulative GPA of at least 3.0 for the final half of their undergraduate coursework. Students complete courses asynchronously through the Canvas learning management system. Ball State's online programs offers multiple start dates throughout the academic year. Students can access support through Ball State Online, including tutoring options, a writing center, and library services. The university also offers full-service tech support by phone and live chat. Founded in 1839, Mizzou represents the first public university established west of the Mississippi River in the United States. The university enrolls nearly 30,000 students annually and more than 3,600 earned their degrees online in the last year. Mizzou offers more than 300 majors and programs across 19 schools and colleges, including more than 100 distance and hybrid programs and thousands of courses through Mizzou Online. Mizzou offers a master's in math education online through its College of Education and Department of Learning, Teaching, and Curriculum. The M.Ed. encompasses 30 credits in math major and elective courses, culminating in a research-based capstone master's project. Students must complete a minimum of 16 credit hours in upper-level coursework to earn the degree. Students explore topics including culturally responsive pedagogy, technology to enhance learning, and curriculum development and leadership. The College of Education at Mizzou receives accreditation through the Teacher Education Accreditation Council. Applicants must hold a bachelor's degree from a regionally accredited institution, demonstrating a minimum 3.0 GPA for their last 60 hours of coursework. Candidates must also submit GRE scores and demonstrate two years of teaching experience for admission consideration. Students may begin the online M.Ed. in the fall, spring, or summer semester. Distance learners complete courses in the Canvas learning management system. Each department assigns academic advisers to new students, offering virtual tutoring opportunities and assistance with designing degree plans. Students can also access online support services, including tech support, financial aid, and disability services. Founded in 1909 in Cambridge, Massachusetts, Lesley maintains its original mission to offer high-quality education to aspiring teachers. The university offers undergraduate, graduate, and professional programs for prospective educators and students of art and design, social sciences, and liberal arts. Lesley offers more than 20 academic programs entirely online. The master's in math education online at Lesley offers a track leading to licensure and a non-licensure track. The M.Ed. in mathematics education encompasses content-based coursework in algebra, calculus, and geometry, and develops assessment and delivery skills. Students in this program also learn teaching methods for grades 1-8 and explore STEM concepts and instruction to prepare their students for further education in the field. Students enrolled in the licensure track may pursue Massachusetts certification to become teachers, instructional resource leaders, and curriculum specialists in elementary school settings. Lesley charges per-credit tuition, specific to the M.Ed. licensure track or non-licensure option. The university offers tuition discounts for Massachusetts residents, students over the age of 55, Lesley alumni, and City of Cambridge employees. Students complete courses online through the LOIS learning management system. Distance learners can access support resources, such as tutoring, advising, and student research opportunities. Additionally, Lesley offers comprehensive library, financial aid, and disability services for online students. Established in 1794, UT Knoxville represents the first public chartered university west of the Appalachians. Part of the UT system that includes campuses in Chattanooga and Martin and an agriculture and health sciences center, UT Knoxville serves nearly 29,000 students and offers more than 900 academic programs across 11 schools and colleges. UT Knoxville's Department of Mathematics offers the master's in math education online. The program requires 30 semester hours in core mathematics coursework and non-math electives. Students must also satisfy prerequisite requirements in college-level calculus and matrix algebra. Candidates for the master's in math education must pass a final comprehensive exam to earn the degree. Applicants must possess teaching certification in secondary mathematics in at least one state for admission consideration. They may alternatively complete at least three years of teaching elementary, secondary, or community college mathematics. This degree best suits high school teachers, but those with experience teaching other grades may apply. The program follows a two-year schedule, comprising one to two courses per semester in the fall, spring, and summer terms. Students complete courses online using the Canvas learning management system. Distance learners can access tech support for online software and programs through the Office of Information help desk or by phone, email, chat, or direct-contact form. Additionally, UT Knoxville offers online students support resources, including cloud-based storage and file-sharing options, workshops and training, and advising and tutoring opportunities. Among Georgia's largest, most renowned institutions, Georgia State enrolls more than 51,000 students across seven campus locations. The university offers more than 250 programs in 100 academic fields of study through its Atlanta campus. The College of Education and Human Development, ranked among the country's best providers of graduate education degrees by U.S. News & World Report, offers the master's in math education online. The M.Ed. in mathematics education at Georgia State comprises 36 semester hours combining professional studies and teaching major courses. The program explores topics in theory and pedagogy of mathematics instruction, school mathematics curriculum, and teachers and technology. The online M.Ed. curriculum follows the Extended Georgia Framework for Teaching and standards set by the National Council of Teachers of Mathematics. Candidates for the master's degree in mathematics education at Georgia State must possess a T4 certificate in math. Applicants must also hold a bachelor's degree from a regionally accredited institution and demonstrate a minimum 2.5 GPA. The program may require GRE scores for admission consideration. Prospective students may apply to the online master's degree in math education during the fall, spring, or summer semester. Georgia State delivers online courses through the iCollege learning management system. The student portal offers a variety of resources tailored to the virtual learning environment, including student orientation videos and after-hours technical support through the IT service desk. The university offers a variety of financial aid options, including payment plans, sponsored billing, and payroll deduction plans for qualifying graduate assistants. Established in 1891 as a teacher-training school for women, UNCG now educates more teachers than any comparable school in North Carolina's Piedmont Triad region. The university enrolls more than 1,600 students and offers 20 undergraduate and graduate programs across six academic departments. U.S. News & World Report recently ranked the online M.Ed. and the graduate education school at UNCG among the best in the nation. UNCG offers an online M.Ed. in teacher education, with a concentration in elementary mathematics education. The program comprises 33 credit hours in core and pedagogical expertise coursework, featuring a professional development and leadership component. The master's in elementary math education online suits practicing, licensed elementary school teachers who hold a class A level license or above in elementary education. Applicants demonstrate a minimum 3.0 GPA for all undergraduate coursework. Students may apply to the online master's in mathematics program for the fall, spring, or summer semester. UNCG does not require applicants to submit test scores for admission consideration, and the university charges different per-credit tuition rates for online graduate students depending on residency status. Online instructors at UNCG may employ synchronous and/or asynchronous course delivery methods in the virtual classroom. Distance learners complete courses online through the Blackboard and Canvas learning management systems. Students enrolled in online programs can access support resources and learning tools. A member of the Georgia state university system, CSU is located just 100 miles from Atlanta and enrolls more than 8,200 students in on-campus and online programs. Students can choose from nearly 90 undergraduate and graduate degrees across seven academic schools. CSU features a master's in math education online through its College of Education and Health Professions. The MA in teaching includes an optional concentration in mathematics. Students in this program may also choose to pursue certification for teaching mathematics to grades 6-12. The master's degree in math education online holds accreditation from the Council for the Accreditation of Educator Preparation and approval from the Georgia Professional Standards Commission. Students must complete 39 credits in four coursework areas: transitioning into teaching, enhancing student learning, emerging teacher, and advanced teacher. To satisfy the third and fourth program area requirements, students must complete a student-teaching experience or internship and a final course in educational research methods. Applicants must hold a bachelor's degree in a related field or at least 25 semester hours of approved undergraduate coursework with a minimum GPA of 2.75. Candidates must also submit a passing score on the GACE admission test, or exemption through satisfactory GRE, SAT, or ACT scores. Students complete courses through the Blackboard learning management system. Distance learners can access the library database, tech support, tutoring and advising options, and financial aid through CSU Online and the MyCSU student portal. All students in the MA in teaching degree pay the same per-credit tuition rate for online graduate study, regardless of their state of residence. Established in 1889 as a teacher-training facility, SRU occupies a 660-acre campus in Slippery Rock, Pennsylvania, nearly equidistant to Pittsburgh and Erie, Pennsylvania and Youngstown, Ohio. One of 14 schools making up the Pennsylvania State System of Higher Education, SRU serves more than 8,500 students and offers over 150 major and minor areas of study, including 40 on-campus and online graduate programs. SRU offers master's in math education online degrees through its online learning division. Students can choose from an M.Ed. in elementary education with a specialization in K-8 math and science, or an M.Ed. in secondary education with a focus in teaching math and science in a STEM concentration. Distance learners must complete 30 credits to earn the elementary education M.Ed. and 36 credits for the M.Ed. in secondary education. Elementary education master's degree candidates must complete a practicum course. Applicants to the elementary education program must hold teaching certification (in any state) and submit official transcripts and a resume to SRU for admission consideration. Secondary education program applicants must present the same application materials, and demonstrate a minimum 3.0 GPA for completed coursework. The secondary education master's degree offers a basic track for unlicensed teachers and an advanced track for educators who already hold licensure. SRU delivers online courses through the D2L learning management system. The university charges varying tuition rates for online graduate students, depending on their state of residence. All of SRU's online master's in math education programs accept applications on a rolling basis. In the following sections, you can learn more about earning a master's degree in math education online, including common math education courses and the time it takes to earn a degree. Though program characteristics vary by school, the next sections provide a general overview of what to expect from math education online master's programs. Mathematics Learning and Teaching: This course introduces mathematics education and covers common teaching strategies. Students explore the basics of instructional planning and identify appropriate strategies and resources, gaining a broad knowledge of mathematics teaching and learning. Instructional Planning and Presentation: This course develops students' planning and presentation abilities. They learn to plan lessons and entire units; study presentation strategies; and explore assessment methods, classroom technologies, and engagement strategies. All math teachers need strong organization, planning, and presentation skills. Classroom Management and Engagement: Students explore basic strategies for managing a classroom and building a nurturing learning environment. They study common classroom management techniques and observe real classes through video conferences or in person. Students also explore ways of promoting self-management in the classroom. Child and Adolescent Development: This course explains the basics of social, biological, and cognitive development among diverse populations. Students also learn to aid development through appropriate teaching strategies. A basic knowledge of childhood psychology and development can help elementary, middle school, and high school educators teach more effectively. Statistics and Probability for Secondary Mathematics Teaching: This class prepares graduates to teach statistics and probability by introducing key concepts and teaching methods. The course covers topics including data representation, sampling, and study design. Students also explore common misconceptions in the field. Math teachers need considerable knowledge of statistics, algebra, and geometry. How Long Does It Take to Get an Online Master's in Math Education? While most master's in math education programs take around two years to complete, program characteristics and personal learning preferences can affect the length of a degree. For instance, the online delivery format can dramatically lengthen or shorten the time it takes to finish a program. In self-paced programs, students move through coursework and complete assignments as quickly or as slowly as they wish. In cohort learning programs, on the other hand, students progress through the curriculum alongside a group. Cohort learners follow a strict course schedule and graduate after a predetermined number of semesters. In addition, some programs let students choose whether to study part time or full time. Part-time students generally take longer to complete a program than full-time learners. Plus, students who take additional credits each semester can accelerate their path to graduation. Teacher licensure requirements vary by state. Generally, schools require a license to teach public K-12 school, much in the same way that a doctor or lawyer requires a license to practice. Paths to licensure/certification can also vary by state. To find out how to become a licensed teacher in your state, contact your state board of education. Postsecondary institutions do not require licensure. You should ensure that your master's in math education online program holds accreditation. A school's accreditation signifies that it meets rigorous academic standards, while receiving an accredited degree provides a host of benefits. Studying at an accredited college qualifies you to apply for federal financial aid opportunities, and many scholarships, grants, and work study programs only award money to students attending an accredited school. Perhaps most importantly, state licensing boards generally require teachers to graduate from an accredited program. You might notice that some schools receive national accreditation, while others hold regional accreditation. The main difference between the two lies in the type of institution to which these accreditation statuses apply. National accrediting bodies usually focus on career-oriented and vocational schools, while regional bodies evaluate more traditional colleges and universities. Only apply to schools that hold national or regional accreditation. Additionally, make sure to prioritize programs that hold programmatic accreditation from the Council for the Accreditation of Educator Preparation. You should understand the other organizations that play a role in accreditation, besides the accrediting bodies themselves. The Department of Education (ED) and the Council for Higher Education Accreditation (CHEA) work together to regulate accrediting agencies and monitor their activities. The ED and CHEA vet accrediting bodies to ensure that they remain trustworthy. You can consult a list of all accredited institutions on the ED website or the CHEA website. Several factors can affect salaries and the overall earning potential for math teachers. For instance, different public school systems boast varying salary structures. In addition, some areas of the country have a high demand for teachers, leading to increased salaries. Work experience can also influence a teacher's wages. Judging by the data below, mid-career and late-career educators take home considerably more each year than teachers with less experience. Additionally, teachers earn differing amounts based on the age group they teach. Consult the table below to explore how on-the-job experience and other factors influence teacher salaries. Earning a master's in math education online readies graduates for a variety of teaching jobs. As students approach graduation, they should consider the age group with which they most enjoy working. Math education graduates can find work teaching basic mathematics concepts to kindergarten, elementary, and middle schoolers. They can also teach more advanced topics like trigonometry, calculus, and linear algebra to high school and college learners. Kindergarten and elementary school teachers instruct young children in areas like reading, writing, and mathematics. They foster basic critical thinking, problem-solving, and communication skills that serve students throughout their education. These educators may benefit from earning a master's in elementary math education online, since many states require a master's degree for licensure. Middle school teachers instruct students in 6-8 grades. They introduce students to more advanced topics and prepare them for high school. Middle school teachers may instruct students across many subjects, or they might specialize in one area like math or science. Postsecondary teachers work in public and private universities, community colleges, and trade schools. They specialize in a particular area and educate students beyond the high school level. Outside of the classroom, postsecondary teachers often work on books or journal articles. Most postsecondary teachers need a doctorate, but some colleges only require a master's degree. High school teachers work in public and private schools teaching a specific subject. They also prepare students for college or postgraduate life. While many public school systems require teachers to earn a master's degree, private school teachers often do not need a teaching license. Current students and recent graduates can benefit greatly from connecting with a professional organization. Professional associations often host networking events where young teachers can make connections and learn from more experienced educators. For instance, the National Council of Teachers of Mathematics (NCTM) hosts an annual exposition where members can learn about innovations in teaching. Professional organizations also provide continuing education, publications, and job boards that can help boost a teacher's career. AMTE improves mathematics teacher education through collaboration between mathematics teacher educators. The organization also promotes research in the field and works to improve diversity among mathematics educators. The association hosts annual conferences and offers webinars. AMTE also publishes journals along with standards for mathematics teacher education. NCTM hosts over 60,000 members, making it the world's largest mathematics education association. Founded in 1920, the organization aims to improve mathematics education through advocacy and teacher resources. Members can learn about the latest developments in the field through NCTM's Journal for Research in Mathematics Education. Members can also access conferences and grants. The MAA joins mathematicians and students, along with math educators at the high school and university levels. Members can attend MAA Mathfest and local section meetings. They can also take advantage of the MAA's publications, including The American Mathematical Monthly and Mathematics Magazine. Earning a master's in math education online can prove expensive even for students who attend public university. Fortunately, master's students can take advantage of many financial aid opportunities to make school more affordable. Students should submit the Free Application for Federal Student Aid (FAFSA) to see if they qualify for any government loans, grants, or scholarships. Prospective teaching students should also research private scholarships and tuition reimbursement programs. Financial aid for online learning is equivalent to what you can find for campus-based learning, but that has not always been the case. Learn about the changes that have taken place and about the different funding opportunities available to online students. Online college programs can serve as a flexible, affordable option for single parents interested in earning a degree and securing their family's financial future. This link provides a list of scholarships, grants, and other financial aid options geared toward single moms and dads.